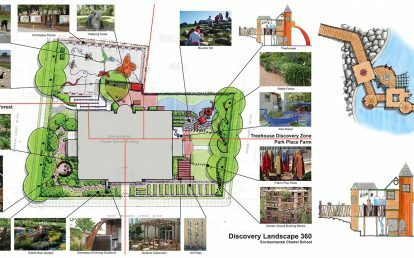 The design of the outdoor learning environment for the Child Care Center at Hort Woods reflects the University’s understanding that “environment is curriculum.” The sensory-rich design provides a variety of settings and elements that immerse children in a daily experience of nature. 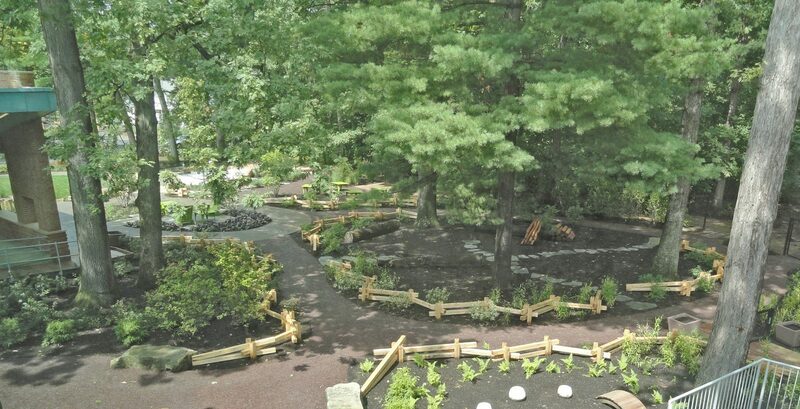 Children ages 6 weeks to 5 years make lasting connections with the natural world as they play, learn, and build in the shade of mature oak trees preserved throughout the playground. 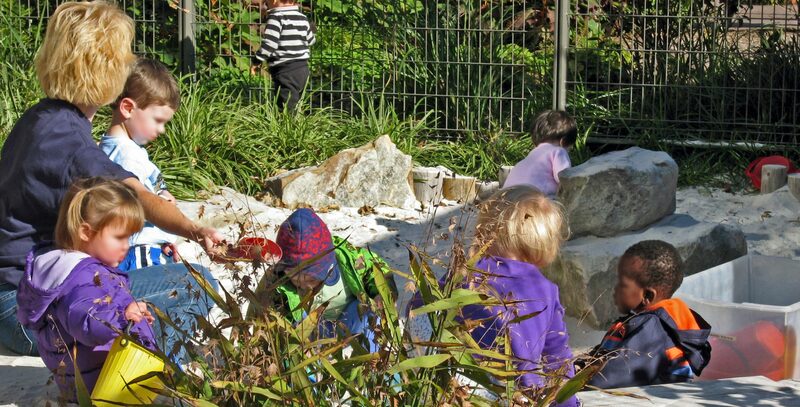 The preschool nature play area has a variety of different spaces for different activities, connected by looping paths. 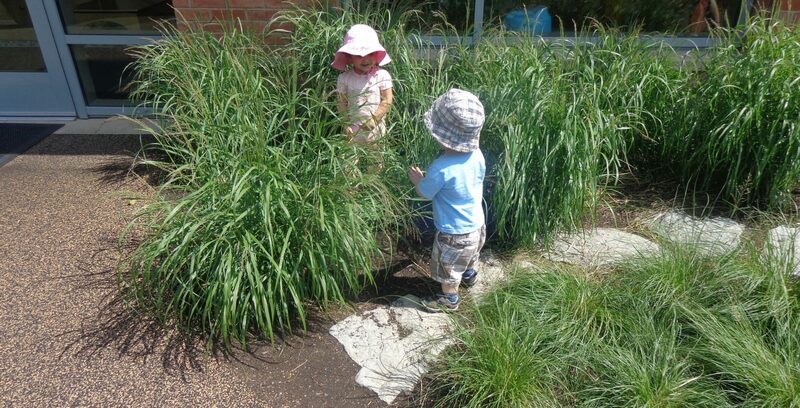 Sand and water play areas encourage kids to develop their creativity and work together to dig and build. There are natural and artificial boulders for climbing. 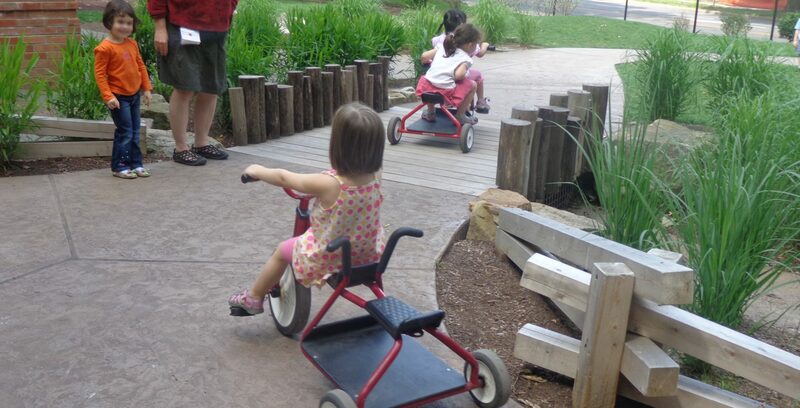 A trike loop crosses wood bridges over the dry stream and through a vine covered tunnel. A rain barrel captures water from the roof, allowing children to release water into the dry stream. 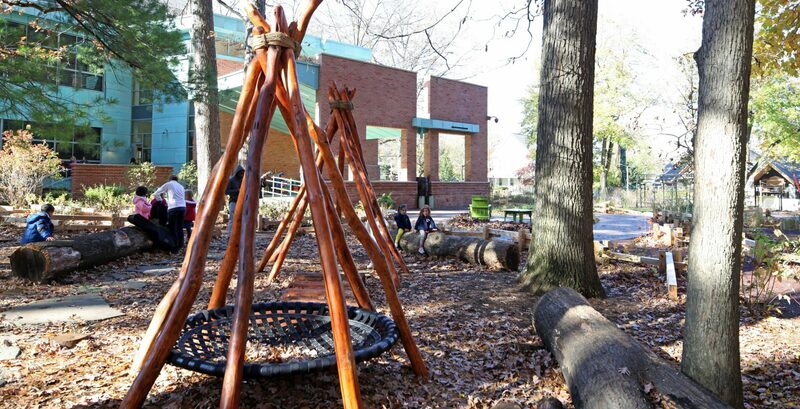 The nature play area under the trees has stepping stones, fallen logs, and wood teepees for loose parts play, dramatic play and building. 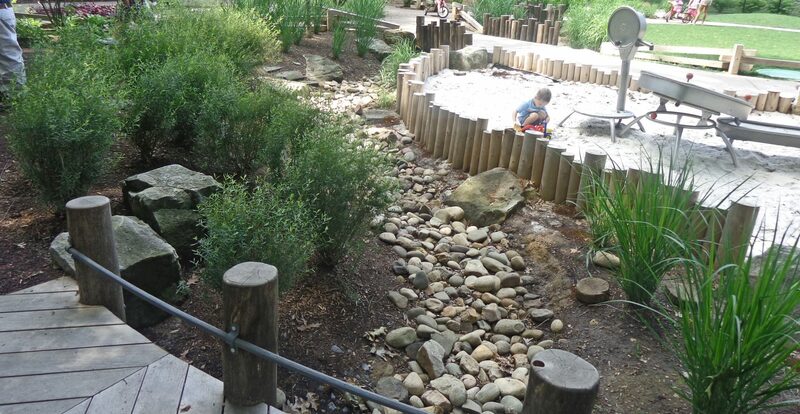 A sand play digging area is edged with wood and rocks and has as a kid-powered water wheel and water table. 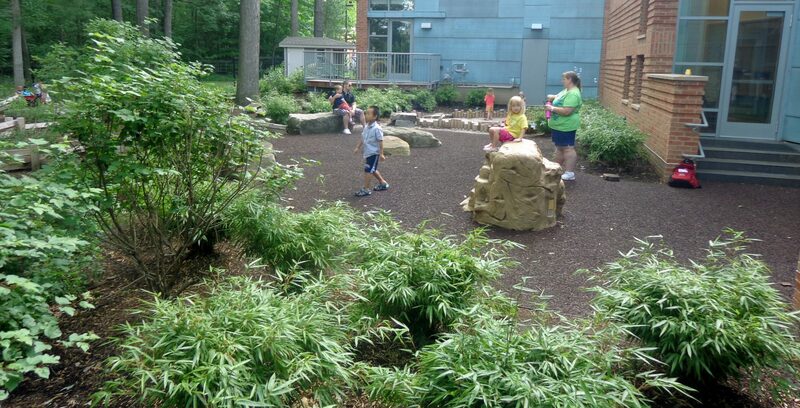 The outdoor spaces at the Hort Woods Child Care center reflect the curriculum and philosophy of the early childhood program at PSU, and provide an important amenity for University families. 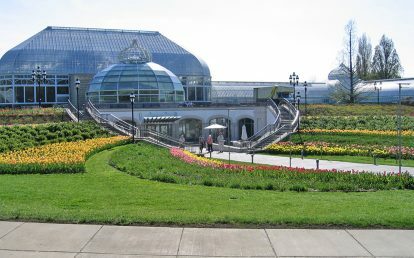 LEED Platinum certified, sustainable materials, green infrastructure, artful rainwater design, porous paving, native plants, tree preservation, passive solar design, natural ventilation. 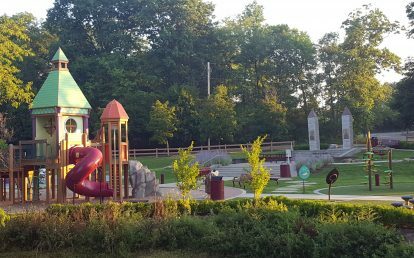 Playground design, nature play design, concept design, schematic design, design development, construction documents, construction administration, LEED templates. 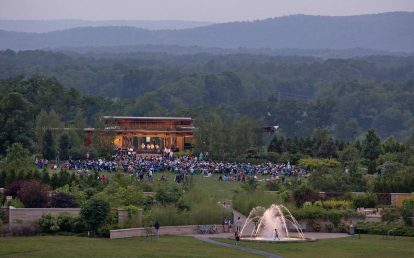 PA/DE Chapter ASLA, Merit Award, 2017.